The sun is still above the tree line, radiating at soft, oblique angles over the calm waters of Spring Lake. Today is Candlemas, the day when ancient people said they could sense the seeds of the growing season ahead quickening in the Earth. When I spent my winters in Massachusetts, on this day I could tell there was something new happening in the woods, even with ice and snow still on the trails. A stronger light was waking things up. I could see water flowing under the icy surface of the stream and the first shoots of skunk cabbage emerging through the snow. All at once, almost surprisingly, there was a sense of thaw in the still deep freeze of winter. Even though Spring is still eight or nine weeks away, late winter feels much more alive than winter solstice or the long dark evenings that accompany the launch of a new year in the Gregorian calendar. Here in Sonoma County, the ground is soggy from welcome winter rainfall. The round hills are bright green after so many months of wearing parched brown. Red-winged blackbirds are calling from the brush. Robins strut in front of a hedge. Ducks fly in from the cloudy blue sky to splash land on the lake. A shy egret cautiously allows me to click a photo before winging to an overhanging branch. I noticed that the reflection of its body captures a depth of being that the standing image of the bird doesn’t capture. We are all ripples in ever-changing waters. The sense that things continue in a static, repetitive way is shattered. 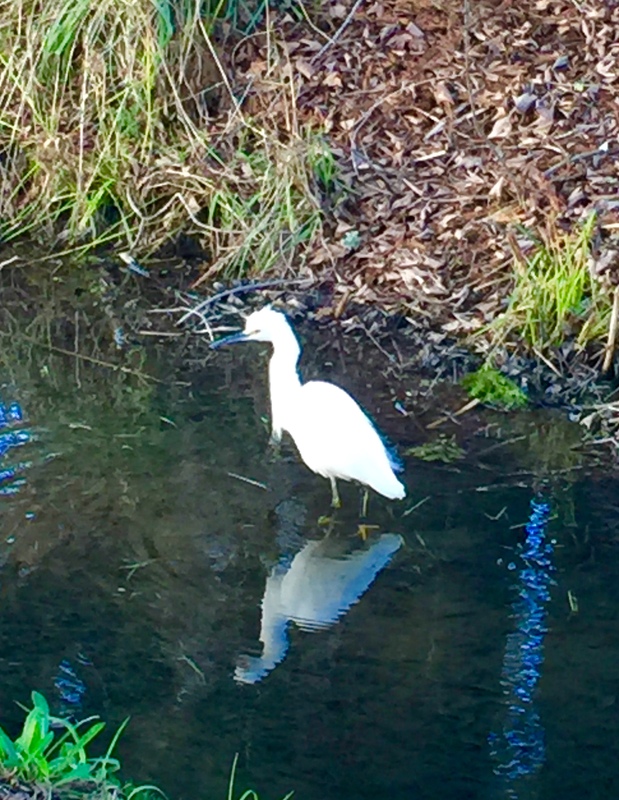 The glimmer of the egret’s shadow image points to the almost imperceptible changes that happen all the time. And today is a day I honor the new life that is emerging all around me. If we look at things straight on we may miss what is quickening underneath. I love this day! To the general culture it is merely Groundhog Day and the little animal is afraid of his own shadow. For me it is a sacred day to acknowledge that life is waking up to the growing season ahead. I enjoy it all, image and shadowy reflection. I delight to feel new opportunities present themselves. My spirit quickens. This time is like no other. Things are changing.